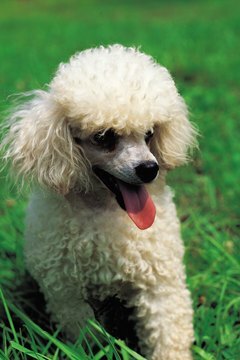 Toy poodles are cute and cuddly looking, making them attractive to children. 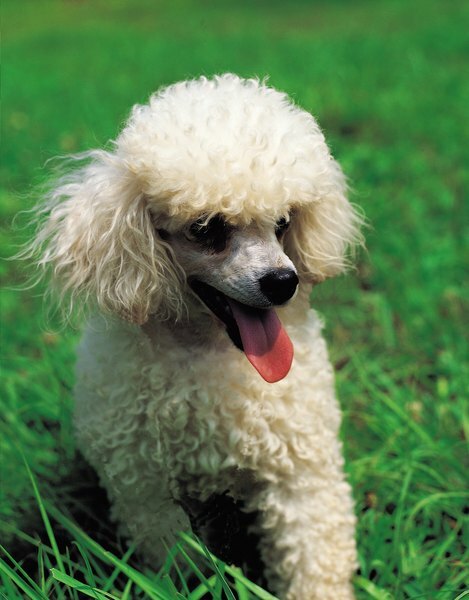 Toy poodles have an average lifespan of 12 to 15 years. Chances are you were at a different place in your life when you brought home your cute little puppy. Now that small children are a regular part of your dog's life, you may discover your poodle is displaying unexpected aggressive behavior. You may not be able to curtail aggressive behavior solely through training your dog, especially if your poodle is older or has health problems that make her irritable. You can eliminate incidents by taking a multifaceted approach to managing her nipping problem. Determine what your poodle's triggers are. You need to know if your dog becomes aggressive when a small child simply enters the room or if she only tries to nip when the child grabs her, pulls at her or teases her. The child's behavior likely is going to play a part in why your dog is nipping. Understanding the behavior that is causing your dog to behave aggressively is crucial to fixing the problem. Talk to your child. If your child is old enough to understand basic concepts and rules, then you need to talk to your children about how their behavior makes the dog upset. Teaching your child not to touch your poodle may be the easiest way to quickly get a handle on your nipping problem. If there are multiple children in the home regularly, all of them need to understand not touch or tease the dog, regardless of how cute and cuddly the poodle looks. Reprimand your child in a responsible way if he decides to torment the dog. Verbally reprimand the dog when it shows aggression toward children, providing that your dog gives warning signals such as growling or snarling before she nips. If your dog nips without warning, you cannot try to catch your dog in the act of being aggressive because it is irresponsible to let your children get bitten by a dog as a training exercise. Separate the dog and the child if your child is too young to understand how to behave around your poodle or your poodle is just too aggressive and unpredictable. Keeping your poodle in a kennel in a room where the child is not permitted to go is an effective and relatively painless way to keep your dog from nipping short-term guests. If it is your dog and your kids, then you may need to work out an arrangement where the dog stays in one part of the house where the children are not permitted to go. Physically restrain your dog if you have to take it into situations where you believe she will behave aggressively, or there is a chance that someone could be hurt by your dog's behavior. Muzzling your dog will prevent her from nipping or biting. A harness attached to a leash will keep your dog at your side and out of trouble. Obtain the services of a professional dog trainer who has experience working with toy poodles. The dog trainer can help you curtain your dog's behavior and retrain her so that she is not so aggressive toward children. You may never be able to make your dog like children. Poodles are sensitive and may react badly to small, noisy and excitable children. An older dog with health problems may be impossible to retrain. If you cannot make your dog behave, your responsibility is to make sure she doesn't hurt anyone else. Muzzle your aggressive dog when children are around and do not let her off her leash. Will Prednisone Cause a Poodle to Loose Clumps Of Hair? What Is the Cause if Two Male Puppies Are Suddenly Fighting?